KAMPALA – Prof PLO Lumumba, the head of Kenya School of Law, has urged the Ugandan government to stop monetisation of politics. About UGX2.4 trillion was spent by candidates in the 2016 general election campaigns and Prof Lumumba said this is disastrous for an economy like Uganda. “Getting elected into political office is now a guarantee that things will come because, in Africa, a politician is a gatekeeper, a tax collector and so on. Parliament should not be a place of thieves because it is a holy place,” he said. 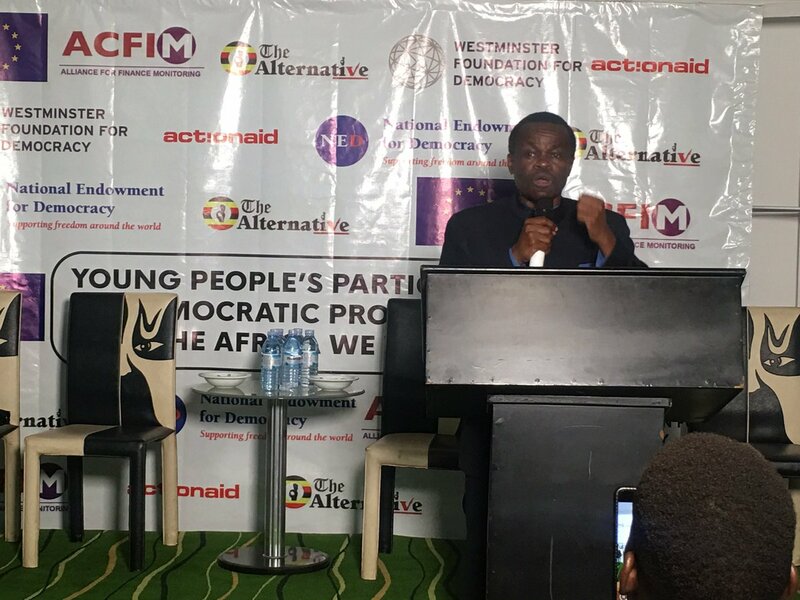 He made the remarks on Thursday during the National Symposium on election financing organised by ActionAid Uganda, Alliance for Financial Monitoring (ACFIM) and The Alternative at Speke Resort Munyonyo in Kampala. Prof Lumumba said political offices in Uganda have been turned into money making ventures. He said political parties must be under penned by clear ideological foundations, which inform the opinions of the people in different areas. “There are very few political parties in Africa; in many countries, we have formations owned by individuals masquerading as political parties with no ideas and they engage in elections every five years and change their names every five years,” he said. However, the chairperson of the NRM electoral commission, Dr Tanga Odoi, said the ruling party should not be blamed for using money in politics, saying campaign financing is used by individuals and parties to compete. “If you don’t have money, don’t join politics; don’t start a political party that will compete with those that have the money. The excess of it (money) is what should be curtailed,” Dr Odoi said. Pan Africanist Dr Kaihura Nkuba also argued that campaign financing is the only way the poor citizens demand for their economic needs. “We should not have a crisis in politics because of money. Our people need wealth so that they get dignity but the governments have given up on them. If leaders increase taxes to have money for their big salaries, why would people not demand for money to elect them?” said Dr Nkuba. The Kyambogo University guild president, Mr Jonathan Tundulu, said political parties have been injecting money in universities to fund their flag bearers, which he said has killed voting for ideas. Kasese Woman MP Winfred Kiiza urged the Electoral Commission to publicise campaign expenditures of political parties. “The law allows the EC to publicise the audited books of political parties. A party that does not ask members to pay subscription uses a lot of money in campaigns and you wonder where it came from,” she said. The symposium was held under the theme; ‘Commercialised Electoral Processes as Barrier to Democratic Dispensation in Africa’.